Snape Wood is a council estate located in the Bulwell Ward in the City of Nottingham. 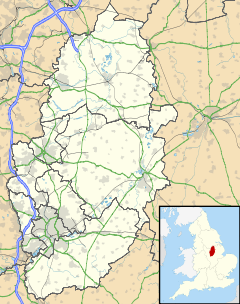 The estate is located 4.4 miles (7 km) from the City Centre, and lies west of Bulwell, north of Hempshill Vale, south of Hucknall and east of Nuthall. At the 2001 census, the estate had a population of 2,937. Snape Wood has facilities located on Snape Wood Road, including a community centre, a family centre, a driving school, and a small park next to the community centre, and there's also a primary school and a local convenience store located off Aspen Road. According to the 2001 census data, the estate has a population of 2,937. A majority of the population is aged 25–44 who make up 32% of the population. The census also shows that 91.7% of the estate's population is White, 3.4% is Mixed Race, 1.4% is Asian or Asian British, and 3.3% is Black or Black British. Chinese people and other ethnic groups each make up 0.1% of the estate's population. The 2001 census shows that 59.6% of the population are Christian and 27.8% of the population are Atheists. 0.3% of the population practice Hinduism, and Buddhism and Judaism each score 0.1%. 1.1% of the population are Muslim, 0.2% are Sikh and 10.7% of the population did not state their religion. N68 Nottingham → Sherwood Rise → Basford → Highbury Vale → Bulwell → Hempshill Vale → Snape Wood → Moor Bridge Line serves at night only. ^ "Snape Wood Community Census Profile 2001". Retrieved 11 November 2017. ^ "Snape Wood Community Census Profile 2001". Retrieved 14 November 2017.